If EC finds out that there is an attempt to sabatoge the election process by withdrawing security of members of political parties, he said, necessary action will be taken, a top Election Commission official said. The Jammu and Kashmir Governor’s administration has withdrawn or downgraded security cover to more than 700 mainstream political leaders, former ministers and former legislators — a step that the three major political parties in the Valley, National Conference, Peoples Democratic Party and Congress have called a “sinister plan” to “incapacitate the entire Opposition during the election process”. A top Election Commission official confirmed to The Indian Express that the poll panel has received complaints from these three parties. “The Election Commission will advise the state that if you won’t provide security, you are disturbing the ecosystem because unless they (political workers) are secured, they cannot go for campaigning and canvassing which is an important element in election process,’’ he said. Withdrawing security to political workers in J&K severely affects campaigning given that militants routinely call for a boycott. The ball is in EC's court. It will dicide if this disturbs the level-playing field. A low turnout also hurts the credibility of the poll process. If EC finds out that there is an attempt to sabatoge the election process by withdrawing security of members of political parties, he said, necessary action will be taken. The government issued a direction to SSPs and Commandants that if those policemen who have been asked to withdraw from guard or personal security duties fail to report back, their salary must be deducted. And if any policeman is put on “unauthorised” security duty of any of the persons whose security has been withdrawn, the salary equivalent of those personnel will be deducted from the salary of the officer incharge. On March 29, a Special Security Review meeting headed by J&K Chief Secretary B V R Subrahmanyam ordered withdrawal of security from around 500 protected persons, majority of them political workers. This list includes 96 leaders and workers of Congress, 78 of National Conference, 66 of BJP, 26 of PDP, 13 of CPI(M), seven of Peoples Democratic Front, five of Awami League, two of Peoples Conference and other smaller parties. The security of 58 former government and police officials was also removed. There are also members of other political parties – for example state presidents of BSP and RJP – and other protected individuals whose security has been withdrawn. Subsequently, there was another list of 18 former MLAs and ministers whose security cover was reduced. This includes nine former ministers and legislators of PDP, four of BJP, three Congress and two from NC. Earlier, security cover of PDP youth president Waheed Para, Shah Faisal and legislator Engineer Rashid was also withdrawn. Said former Chief Minister Omar Abdullah: “There is no basis for this withdrawal, no security review mechanism was followed…When the security of Shah Faisal, Waheed Para (of PDP) and others was withdrawn last year, I tweeted about it. I got a call from the Governor telling me he disagreed with this security withdrawal and that he had not been kept in the loop on this. He assured me that security (to the political workers) would be restored. He asked me to give him a list of all those people whose security has been downgraded or withdrawn. While we were in the process of preparing that list, more people including (former minister and Shia leader) Agha Ruhullah’s security got reduced and lot of people lost their security. Governor’s assurance meant nothing”. Abdullah said that when he was CM, he didn’t get involved in security reviews since this was “always a police and intelligence-driven process, which doesn’t seem to be the case today”. Sources said the NC has “strongly objected to the role of the Chief Secretary in over-ruling the dissent put forth by the J&K Police’s CID and IB in the security review meeting”. Both NC and PDP have also complained against ADG Security Munner Khan alleging that the current administration has “already given him a post retirement job” and that his “continuation in his current post and (being) nodal officer for elections is conflict of interest”. “They have withdrawn the security cover from the residence of our former MLA in Shopian. They have downgraded security of our former ministers who live in South Kashmir. Everyone is aware of the situation here,’’ she said. “I will give you an example. If anybody from our party joins People’s Conference, his security is increased. If anybody with security joins our party, they withdraw his security. This is how it functions”. ADG Security Muneer Khan said that the list has people (whose security has been withdrawn) has names from every political party and there is no partiality. When asked that three political parties have written to EC, he said, “We will respond to them”. Responding to the allegations of conflict of interest because he has already been named as Information Commissioner after his retirement in June, Khan said that he had asked the EC to relieve him as nodal officer for elections. “I want to be relieved so that I join (Information Commission). The EC has also sought a panel of names to replace me (as nodal officer),’’ he said. The list also includes several State government officials who were accorded security at the height of militancy. “State police has provided security to retired bureaucrats, judicial and police officers, ex-MLC, ex-MLA, Sarpanchs and media personnel based on threat assessment. 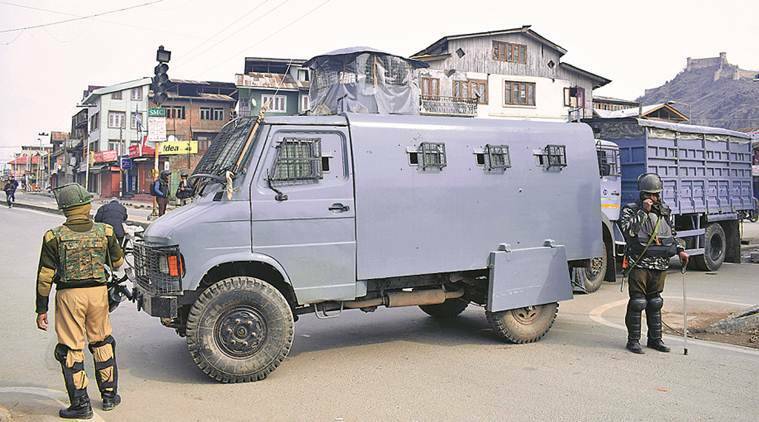 In some cases, they were provided with vehicle along with the security personnel,” a Union Home Ministry official said.